Kihei Kai Nani ***CLEAN*** New Remodel Deluxe Unit Close to Ocean! Paradise Is 300 Steps To The Beach, Fully Loaded, Comfortable And Clean Condo! This just finished fully Remodeled Condo is waiting for you to enjoy a comfortable stay. Brand new couch, bed, sofa, appliances, toilet, sink faucet and more is brand new. It offers deluxe at the fullest starting with Three beds. One King size bed with 14" foam mattress in bedroom, Also with paid additional guests fee, Queen size wall bed in living area, plus Queen size sofa Sleeper with 8.5" mattress! Also, Room darkening drapes and individual reading lights above bed plus USB outlets at your bed side! A/C in living room and A/C in bedroom! Lots of closet room and very large brand new dresser. Has a luggage storage closet, for your luggage and coolers ( we supply the coolers), and laundry basket. Free unlimited long distance even in Canada. Free Parking, a Hana Cd, some movies, board games, cards, plugs in the living room for USB outlets, safe, Beach chairs, Beach towels, Some beach boards and floats. A nice lanai to sit and have coffee or just read a book. We have the largest swimming pool in South Maui Condo Rentals, BBQ grills on complex, Shuffle board, Fruit trees. Our condo is one the the cleanest in the complex. We will make sure your stay is one to remember and you will be back! Beautiful Kama'ole Beach 2, has excellent snorkeling, boogie boarding, or just bathing in the sun. The beach has lifeguards and restrooms. Picnic tables and BBQ's on the grassy area of the beach. A beautiful scenic coastal trail near by for your morning walks or for jogging. Restaurants, shopping, Bus service, Rental car, Snorkel gear or scuba gear rentals are all within walking distance. We do have 2 designated smoking areas these are the only places you can smoke on complex. Mahalo!! No Resort Fee and Free parking! Please contact owner for any questions and booking info! We will make your stay one of the best you ever had. Maui is a amazing piece of paradise! We will make sure you feel the Aloha that we have put in the condo. We know alot about the island and want you to enjoy it! Give us a call!! aloha, We do live on complex so we know you will enjoy your stay. We make sure everything is right the first time so you will enjoy the time you have here. We are just a phone call away for what every you need! Give us a call while you are here! The property is everything you need. Beach close by/ BBQ's/Very large swimming pool/Friendly and lots of Aloha. Being on complex and living on complex helps if you need anything. We have lived here for over 14 years and each day a new opportunity pops up! Maui is amazing and what you to enjoy it like we do! We are fully deluxe condo and have everything you need to free long distance. Yes even in Canada!!! A washer and dryer so pack light!!! Mahalo!!!!! You are within 400 steps from one of Maui finest snorkeling and swimming beach, paddle boards, dolphins, turtles. If you get lucky you might even see an Hawaiian Monk Seal. Just look out the bedroom window you can see Science City from Haleakala Crater. **Yes** we have a telephone in the unit!! Cordless Phone with an answer machine! Free Unlimited Long Distance in he US and Canada! We do have air conditioning, if you choose not to go with the a/c, there is a $10 per night discount available at the time of booking! Clean Unstained and not torn! and Bed Bug Free! We have a large 27" laundry center in the unit for your convience! FREE Parking! You can park anywhere on the complex, just check-in at office and get a parking pass. Free Internet wired and wireless!!! We have brand new and clean towels without stains and smell good! New Tropical sofa has a 8.5 inch mattress. Glass top end tables and coffee table. Also has a swivel rocker padded chair in living area. BRAND NEW!!!! WORKS WELL AND IS VERY CLEAN!!! BRAND NEW OVEN!!! VERY CLEAN!!! BRAND NEW!!! WORKS WELL AND IS VERY CLEAN!!! BRAND NEW COFFEE MAKER WITH A TIMER! VERY CLEAN!!! BRAND NEW!! VERY CLEAN AND WORKS WELL!!! EVERYTHING IS BRAND NEW!! FULLY STOCKED UTENSILS AND DISHES!!! Fully deluxe kitchen Brand New!! EVERYTHING IS BRAND NEW!!! EVERYTHING IS WORKING WELL!! VERY CLEAN WITH FULLY STOCKED UTENSILS! YES WE HAVE A BLENDER!!! BRAND NEW!! 4 CHAIRS AND GLASS TOP TABLE! ALSO A TABLE WITH 4 CHAIRS FOR OUTDOOR SEATING ON THE LANAI!! GREAT TO EAT OUTSIDE AND ENJOY THE WONDERFUL WEATHER/HEAR THE BIRDS/IN A GARDEN SETTING!! Two flat screen TV's, A 49 inch in the living area and a 40 inch in the bedroom! We do have an under the TV radio CD player in the living room to play your new Hawaiian CD! Both livingroom and bedroom TV's have a DVD/Blu-ray player! Some books and, Yes we have the Blue Book - Maui Revealed! We have board games , cards and Cribbage! We have some beach toys! Some movies plus our own Maui Movies of turtles,dolphins, whales, fish, big wave surfers,etc. Lots of courses on Maui! ONLY in the 2 destinated areas!! 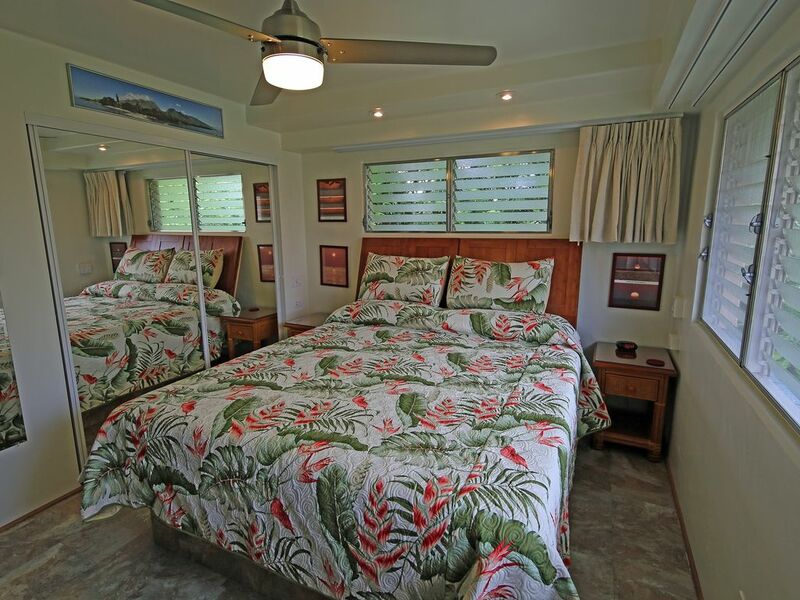 The complex has a 30' x 60' swimming pool the largest of South Maui condos and for shade and comfort has 3 pool side Cabanas with curtains for privacy. also plenty of chairs, tables and loungers. Lots of storage space so you can put your luggage and things away and still have lots of comfort. We have beach chairs and umbrellas. Towels for beach and coolers. We do have a safe, ice maker and filtered water!! All supplies in condo unit are starter sets only. The outside deck is awesome to sit on and listen to the birds in the morning and watch sun rise. The condo was very clean and has everything to keep it clean while on the stay. The owner is very sweet and just a call away we needed another bed to let our daughter sleep and she was more than willing to accommodate that. We can’t thank her enough for giving us a great trip and place to stay. We love KKN. We always consider other condos but choose to stay at KKN. 3 beds, all very comfortable firm mattresses. Black out curtains in the bedroom. Nice amenities- new beach chairs, nice boogie boards, plenty of towels. Overall, the use of space in this condo made it very comfortable for 4 adults. We’ve enjoyed all the KKN condos but this was definitely our favorite so far!! Cindy and Jeff's condo is great. Recently upgraded and has all the amenities that you need. Ideally located, immaculately clean and so well appointed. We will be back!! Thank you for a great stay. The condo is clean and up to date. Good location! You are close to the beach and can walk to shops and restaurants. The condo was clean & comfortable and only footsteps away from the beach and shops! Thank you for the wonderful review! You left the condo amazing. Very nice to meet you guys! Hope you enjoyed the rest of your stay on Maui. Looking forward to see you again. This complex is in the Maui Reveled Book and has a gold bar. You can't beat the value for the money the beach is within 300 to 400 steps. Great location Restaurants and shops nearby. Walking distance. Large swimming pool and BBQ grills on complex.